The trial of former President Park Geun-hye will begin on May 2, a week before the nation elects a new president. The first preparatory hearing, in which Park and prosecutors are asked to explain their stances on the case, has been set for 10 a.m. at the Seoul Central District Court, sources at the court said Friday. Park, in custody since late last month, faces a total of 18 charges, including bribery, abuse of power and leak of government secrets. She was removed from power over the allegations in early March. Choi Soon-sil, Park’s friend of 40 years who has been at the center of the scandal, will be tried alongside Park once Park’s trial opens. She has been standing her own trial for extorting donations from local firms for the K-Sports and Mir foundations. Prosecutors claim that Park and Choi colluded in a 59.2 billion won bribery scheme involving three local firms -- Samsung, Lotte and SK -- and the two foundations allegedly controlled by Choi. Lotte Group chairman Shin Dong-bin will also stand trial together with Park and Choi, but not under physical detention. He is accused of offering bribes to Park, expecting the ex-president to help the group secure a business right for a duty free shop. It remains unclear whether Park, Choi and Shin will appear at the May 2 hearing as it is not mandatory for a defendant to attend a preparatory hearing. Once the formal trial begins, they are required to appear. Park has denied all the charges, saying that local firms voluntarily donated the money. 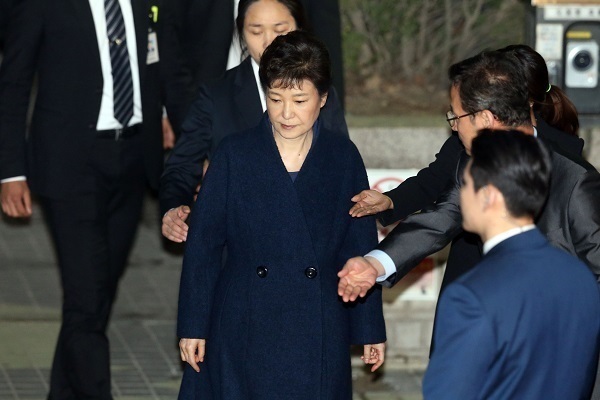 Park was expelled from office on March 10, with less than a year remaining in her five-year term, in a unanimous decision by the Constitutional Court. The parliament voted to impeach her over the corruption scandal on Dec. 9.